Christmas might be at the forefront of everyone’s mind, but hot on its heals is arguably the social event of the year – Sydney New Year’s Eve 2018. As the clock ticks down to the end of 2018, this year’s New Year’s Eve promises to be bigger, brighter and more spectacular than ever with a simply breathtaking fireworks bonanza planned for Sydney. As always, George’s Mediterranean Bar and Grill will provide a front row seat for all the festivities, so here’s a sneak peek at what’s in store for Sydney New Year’s Eve 2018. This year’s New Year’s festivities feature two sets of fireworks, a harbour of light parade and a host of entertainment, with proceedings officially kicking off on the Harbour with pre-show entertainment at 6pm. The fireworks take place at the family-friendly time of 9pm and then the major official fireworks kick off the new year ticks over at midnight, with both promising to offer a truly spectacular event that is destined to elicit awe and amazement. In between there are also a host of activities and events planned. At 6pm the evening commences with a dazzling aerial display of the nation’s finest flying aces. At 6.50pm, a tug boat takes centre stage in Sydney Harbour with a stunning water display followed by an encore aerial performance at 8pm. Meanwhile, a feature of the evening will be the Harbour of Light Parade from just after 9pm. This event sees illuminated ships gliding across the water, in spectacle a designed to enchant spectators of all ages. Each vessel is decorated with colour changing light, dazzling the crowds and adding to the unique choreography as they dance in the harbour. There are fabulous vantage points around the harbour where crowds can catch the fireworks in all their glory, and Darling Harbour and Barangaroo are among the prime destinations. The official Sydney New Year’s Eve website notes attendees should plan their evening early and prepare to arrive well in advance in order to secure the best position. You can see a full map of the best vantage points here. Meanwhile, Darling Harbour always goes above and beyond to bring in the New Year, so here’s an insight into what’s on offer. 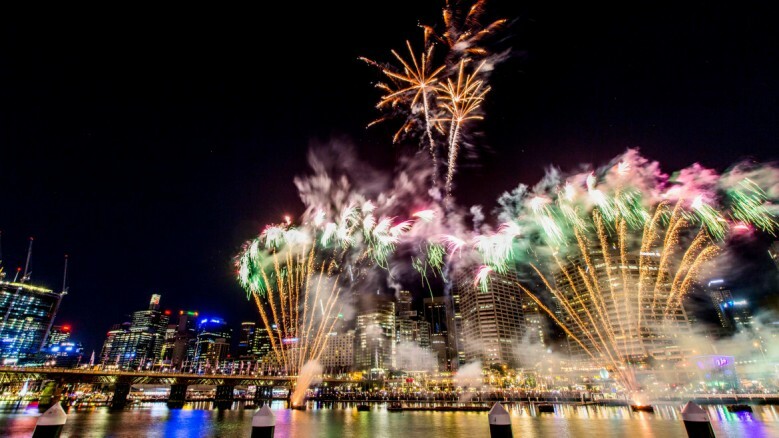 Noted as a family-friendly venue to enjoy all the festivities of New Year’s Eve, Darling Harbour offers a host of activities in addition to the traditional Harbour fireworks. From 7pm there will be fireworks every hour, in addition to free flame shows and the official fireworks in Cockle Bay as part of the full New Year’s eve spectacular at 9pm and midnight. Organisers note there will be road closures on the night, but trains, light rail and bus transport is available. Each year George’s Mediterranean Bar and Grill offers a front row seat for all the excitement and adventure of New Year’s Eve, and this year promises to be no different. We’ll be featuring live entertainment and a wealth of activities along with a menu that’s destined to delight. Spaces are limited, and bookings will be required, so contact us to secure your spot early. Located on the King Street Wharf amidst the beauty and excitement of Darling Harbour, George’s Mediterranean Bar and Grill is renowned as one of Sydney’s premier eateries. Come share the hospitality for which we are renowned as we serve up a sensational New Year’s Eve in simply stunning surrounds. You can learn more about our function facilities here, or contact us directly for further advice.